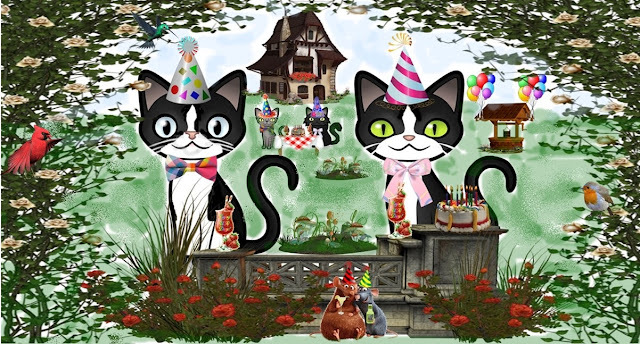 Wendy's 3-D Cats: HAPPY BIRTHDAY TO OUR DARLING DOMINO -- AND ALFIE, TOO! 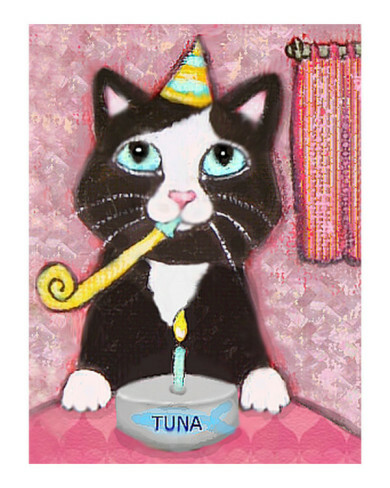 HAPPY BIRTHDAY TO OUR DARLING DOMINO -- AND ALFIE, TOO! It's Domino's birthday today. Being a ladycat who is dating a younger mancat, she is loathe to reveal her age but whatever the number, she's still very kittenish. 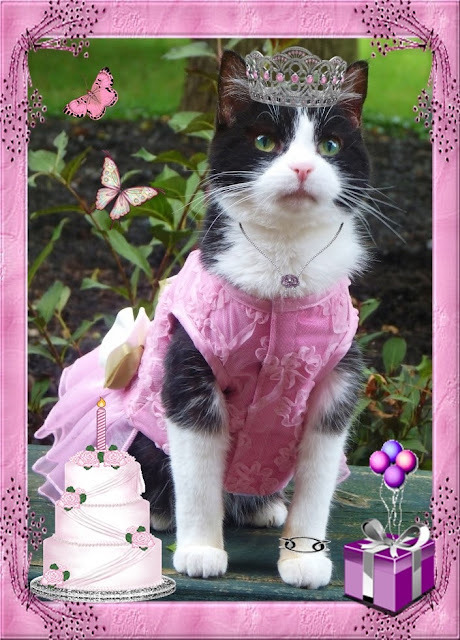 Last year Domino rocked a purple birthday frock, but this year she's definitely in the pink! Domino is more than just Queen for the Day -- she is queen of our house every day of the year. Befitting her status she is wearing a pink-jewelled crown atop her pretty little head. Her necklace is pink sapphires in the shape of a rose and her bracelet is black and white diamonds -- just PURRfect for tuxy royalty! 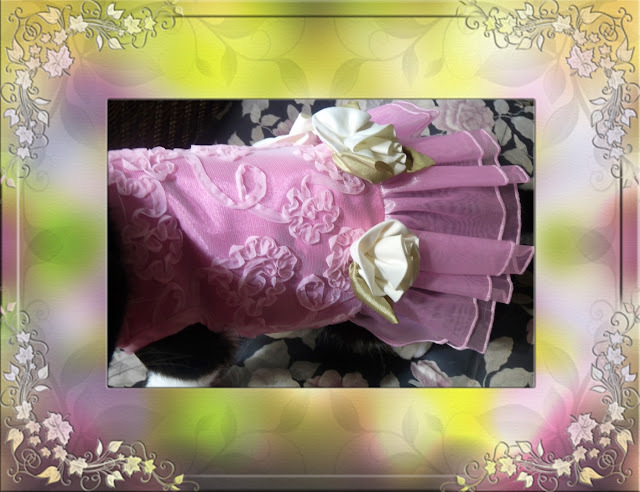 Domino's dress is pink lace and tulle adorned with ivory-coloured roses on the back. It was a birthday gift from Mama because she knows how much Domino enjoys modelling a new dress. It was so gratifying to see Domino's face when she first laid eyes on it. "O fanks yoo, Mama -- it's gorjuss! Yoo always noes exactleh wot I likes", she said. 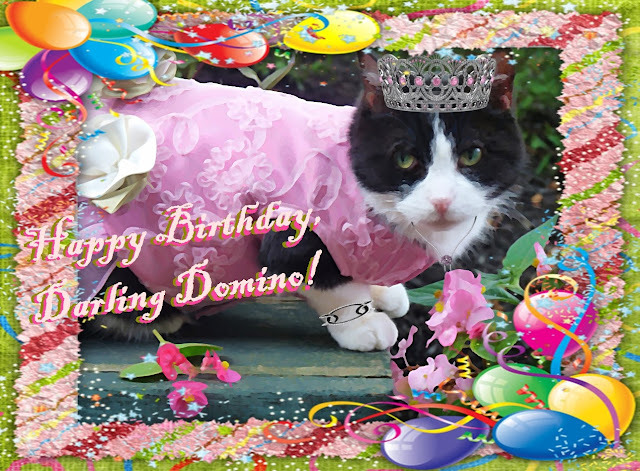 So, Happy Birthday dear Domino! You are, and always will be, as pretty as a picture. After our party here, Domino will be boogeying on over the pond to celebrate with her beau, Milo. Milo has just moved into a new home in the Cotswolds (in England) which has a big back yard -- just PURRfect for a double birthday bash! You see, it's a double birthday bash because it's Milo's brother Alfie's birthday today, too! Alfie and his girlfriend, Cory, are all partying together. They are in the back garden waiting for the rest of the guests to arrive. Even the wishing well is decorated to wish the birthday kitties well! They may even have a few unexpected guests, but on a day like this -- the more the merrier. 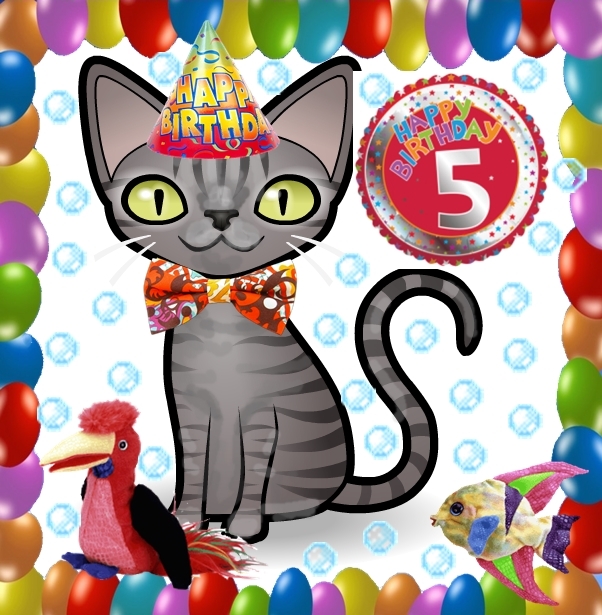 Happy 5th Birthday, Alfie Marshall! Even Hello Kitty wants to get in on the act!